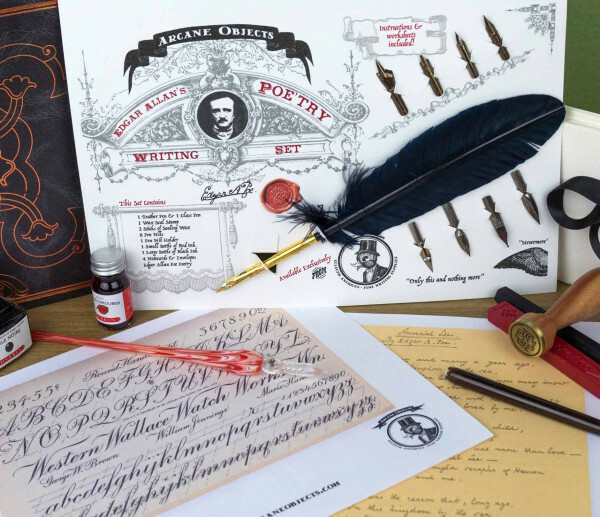 Announcing the newest Calligraphy Kit from Arcane Objects! 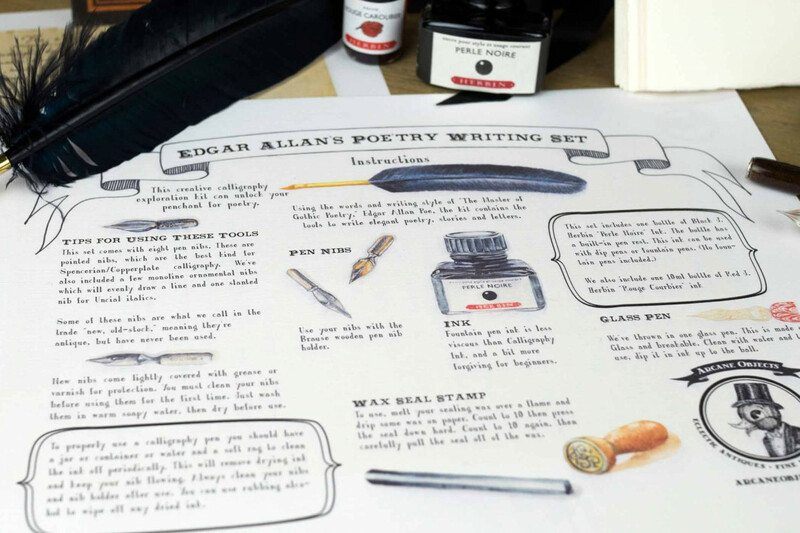 This creative calligraphy exploration kit can unlock your penchant for poetry by using the words and writing style of "The Master of the Surprise Ending," Edgar Allan Poe. 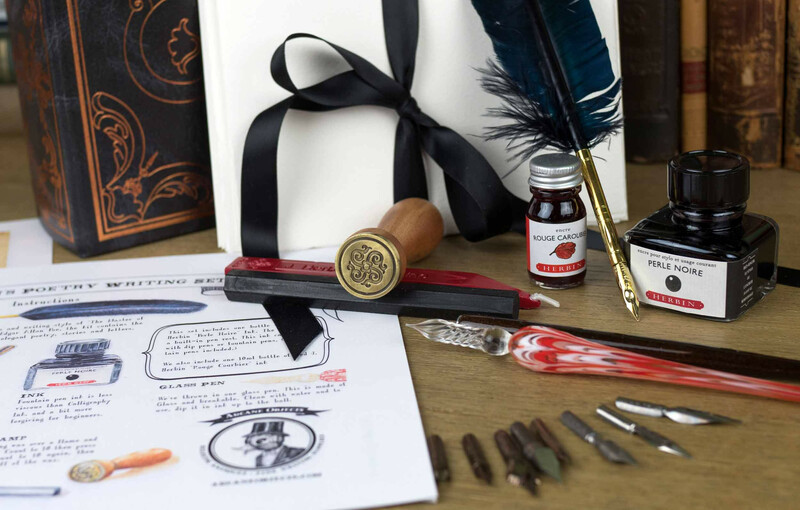 We're extremely excited to announce the release of the latest in Arcane Objects' line of exclusive calligraphy sets. 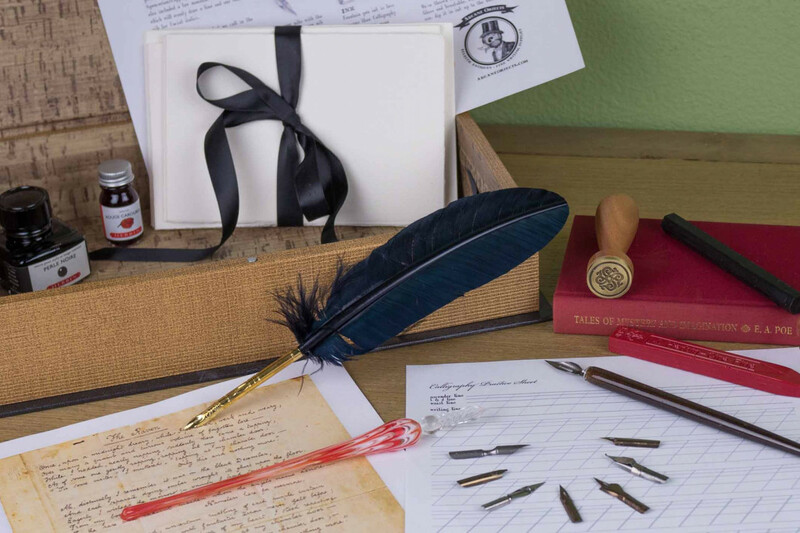 One quill feather pen to write or draw with. Eight assorted pen nibs. Some are new, and some are unused antiques, what we in the trade call "new, old stock." One 30ml bottle of Black J. Herbin "Perle Noire" Ink. One 10ml bottle of Red J. Herbin "Rouge Courbier" ink. Five Fabriano Mediovelis folded cards and five matching envelopes. We've also included a print-out of an antique Spencerian Alphabet page so that you can see the letterforms and practice. 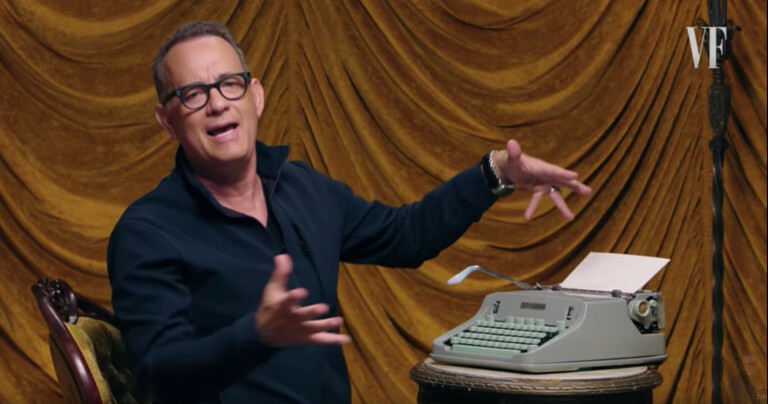 The arrows on the letters indicate the direction you move your pen to write the letters. You also get - two Poe poems, written in his own handwriting. Two Calligraphy practice pages with instructions. Two full sheets of instructions. 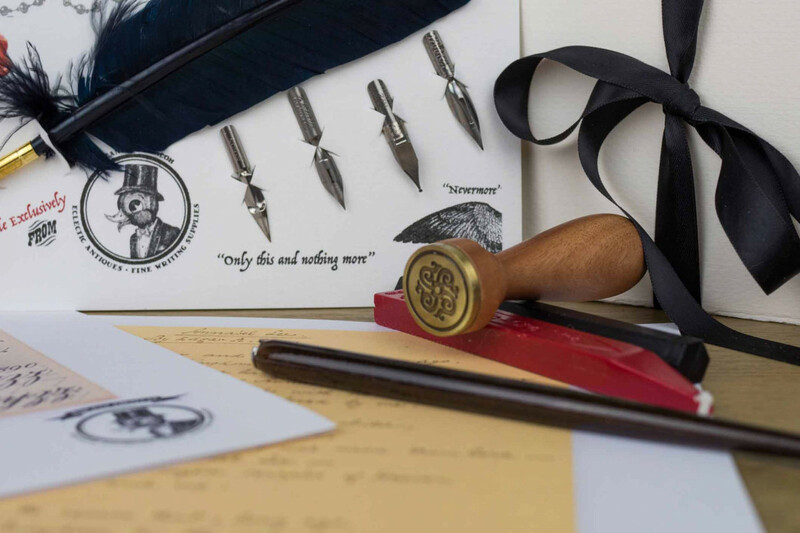 The pen nibs included are pointed nibs, which are the best kind for Spencerian/Copperplate and Modern calligraphy. We've also included a few ornamental nibs which will write a line evenly and one slanted nib for Uncial italics. Since Edgar Allan Poe was writing during the 1840s, he would have written in the American version of Copperplate cursive. 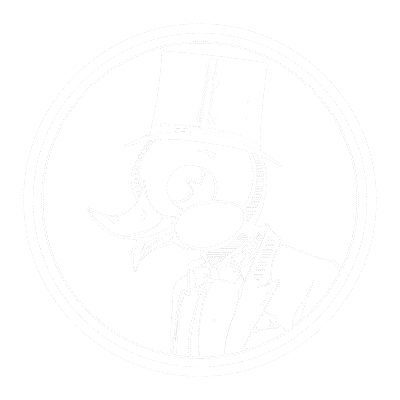 This was called Spencerian Cursive which was widely taught in the United States in the nineteenth century. 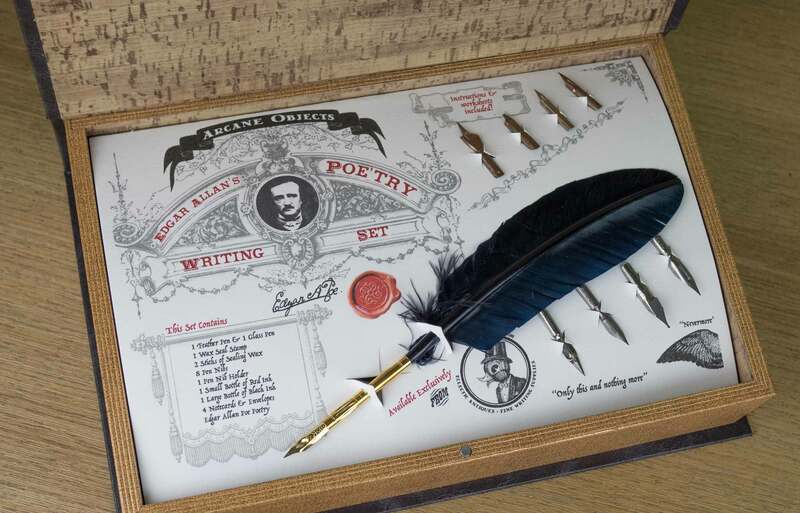 We've included two of Edgar Allan Poe's iconic Gothic poems in this set. (You can find all of Poe's) short stories, like his groundbreaking detective story "The Murders in the Rue Morgue," and his other poetry online or at any fine bookstore. 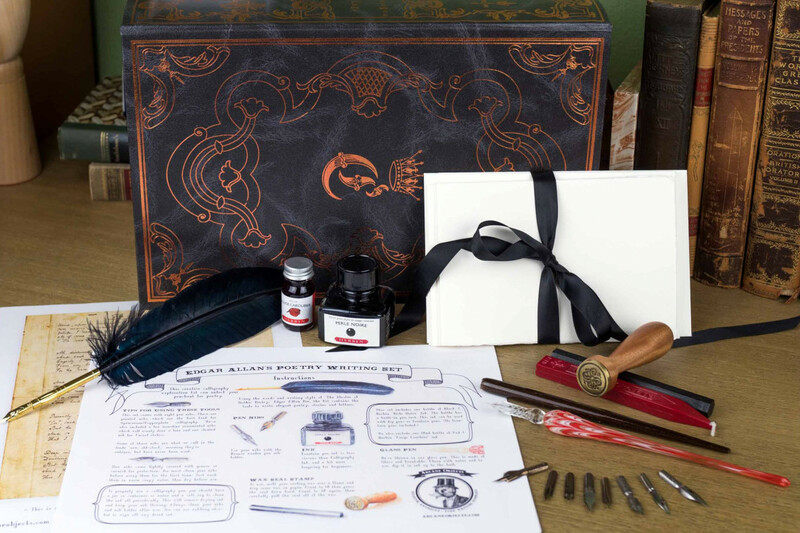 This unique calligraphy set can only be purchased for USD $115 through Arcane Objects. You can buy online from our Etsy shop, our online shop. Thanks for reading this! 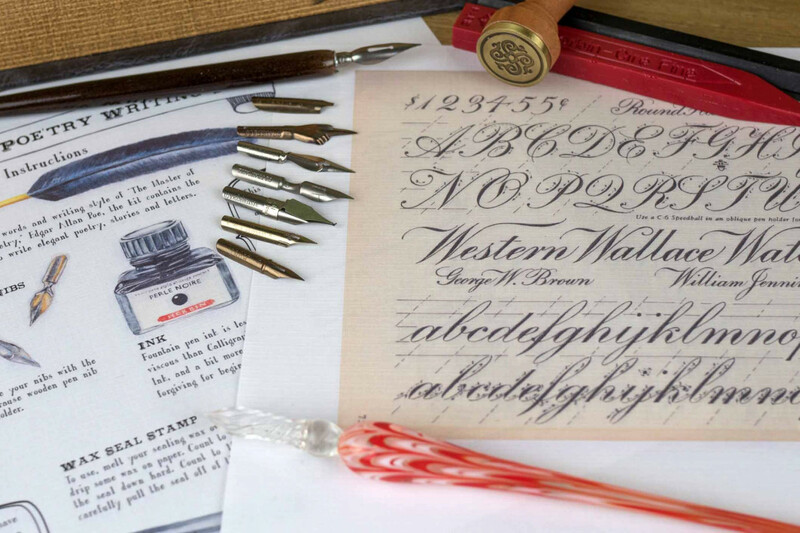 You can download a free Calligraphy Lettering Practice Sheet here! 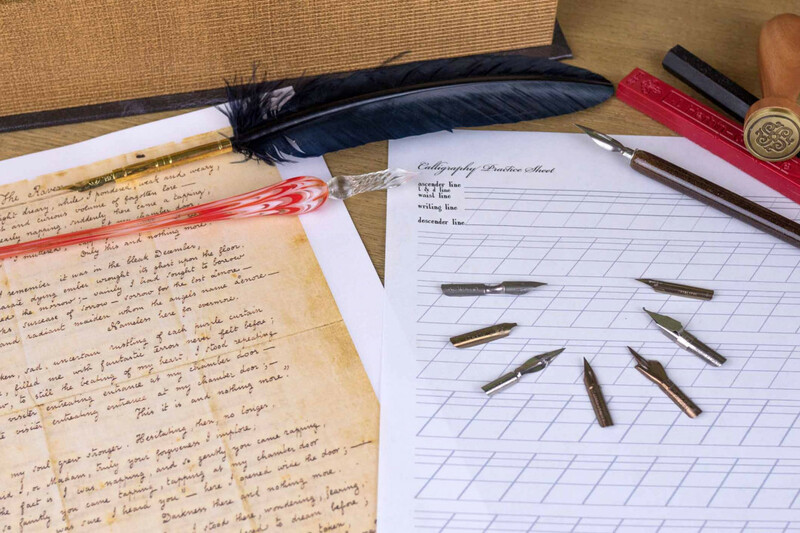 Sign up for our newsletter (in the footer), to learn about sales and other calligraphy instructions giveaways.